You are purchasing a beautiful Thomas Kinkade print - Split Rock Light. 14” x 11” Matted. New old stock. With COA. Please have a look at the photos for a detailed description of what you’ll be receiving. Thank you very much for shopping with us! We hope you enjoy your purchase!!! You are purchasing a beautiful Thomas Kinkade print - Sunday At Apple Hill. 11” x 14” Matted. New old stock. With COA. Please have a look at the photos for a detailed description of what you’ll be receiving. Thank you very much for shopping with us! We hope you enjoy your purchase!!! THOMAS KINKADE. FLAGS OVER THE CAPITAL. in the pictures,if you dont see it in the picture ,you will not receive it. See pictures for more details and condition. The soft warm original finish is present with no buffing or machine polishing. Thomas Kinkade. 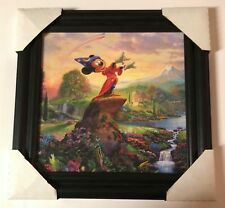 Limited Edition prints are the finest, most desirable Thomas Kinkade prints available. Our reproduction process captures not only the color and mood of Thom’s enchanting original painting, but the actual brushwork as well. And to the best of my ability/knowledge. and I will do my best to promptly answer. 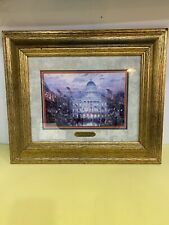 Absolutely beautiful signed and numbered limited edition offset lithograph on canvas of an original oil painting by Thomas Kinkade published in 1993. This hand signed piece is number 567/1480. The canvas itself is 19-1/2” x 16”, beautifully framed is 31-1/2” x 28”. Thomas Kinkade "Petals Of Hope". Stillwater Bridge ("Sweetheart Gardens I") Stillwater Bridge is the first painting in Thomas Kinkade's Sweetheart Gardens series. 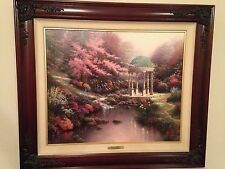 The other painting in the collection is Sweetheart Gazebo. Stillwater Bridge depicts a bridge inspired by an actual bridge Kinkade saw in England and is the only painting in Thom's Bridges that is similar to his popular painting titled Bridge of Faith. And I will do my best to promptly answer. Thomas Kinkade "Paris City Of Lightts". Thomas Kinkade "Olde Porterfield Tea Room". Thomas Kinkade "Blessings Of Autumn. Signed Numbered G/P 165/200 Canvas. Thomas Kinkade "Victorian Garden II". Signed Numbered 2057/3950. Certificate of Authenticity. Artwork size 20" x 16" under plexiglass.